Knowing the right size of batting glove beforehand will give you a quicker, stress free shopping experience. Below are steps to quickly determine the right size of batting glove for you. Open your dominant hand out flat, palm side up. Make sure your fingers are straight and firmly together. For the actual measurement, use a tape measure or a ruler. 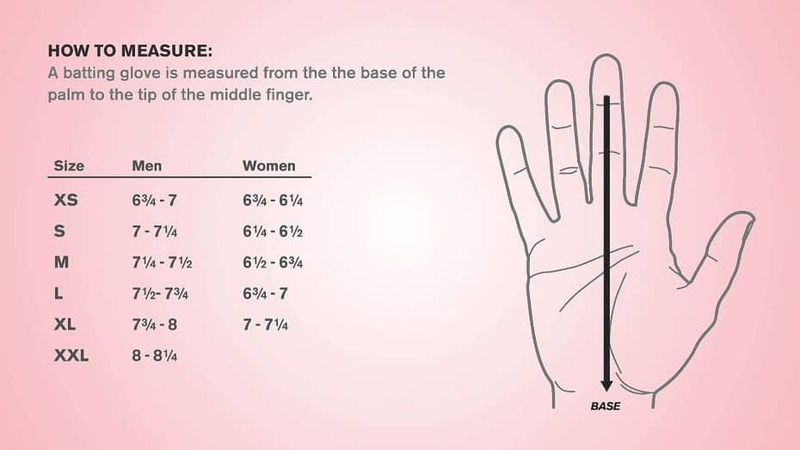 Measure from the base of your palm to the tip of your middle finger. Use the tape to determine your ideal batting glove size. Most adult hands will range between 6 3/4 to 8 inches. Determine your glove size. Check out this chart for the proper hand measurements. 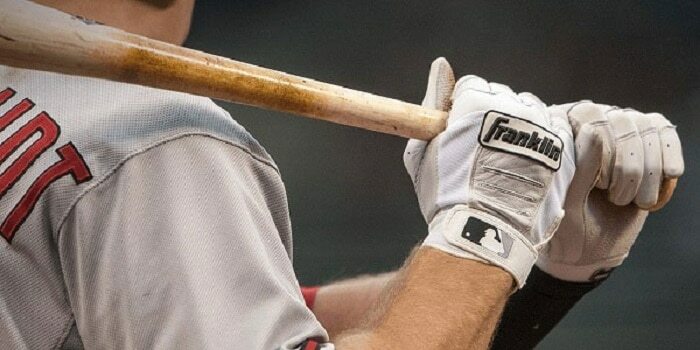 Batting Glove Sizing Chart: How to Measure your Hand for a Batting Glove – Should you find a batting glove that is sized differently, it is likely that the manufacturer of that glove has a different sizing chart for that brand. You can now try on the batting gloves you believe are the right fit for you. When tying them out, flex and bend your hand. A batting glove with a proper fit will not constrict hand movements at all. Even better if you have your baseball bat with you. You can test out the feel of your swing with the batting gloves on. Padding: Helps reduce vibration from hitting with the bat. Breathable material: This material provides optimal performance on hot days by quickly drying out any sweat or moisture. Take the Franklin CFX Pro batting gloves: These have sheepskin leather for comfort and better grip in any weather. Another great feature is the Quad-Flex creasing on the palm. The creases as seen in this image, mimic the creases in your hand, for comfort and a more natural feel.